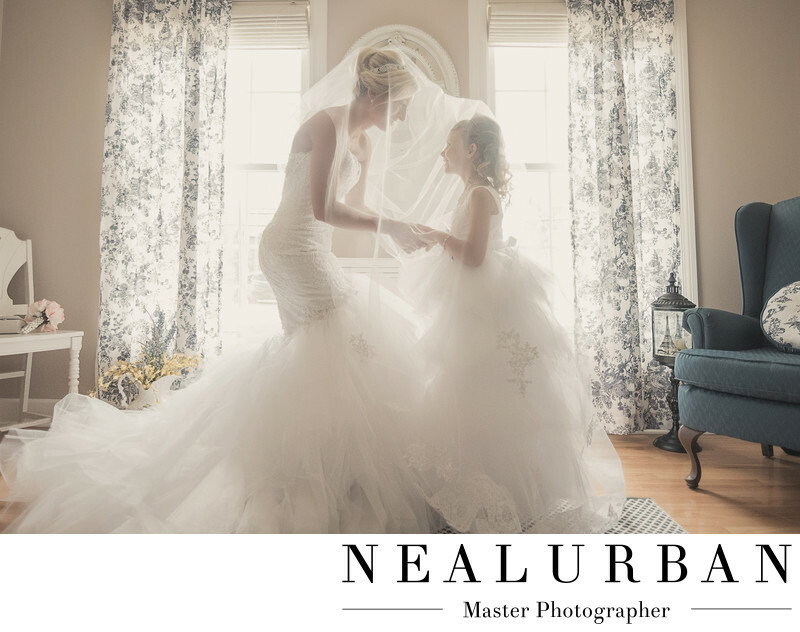 When we met to finalize all the details for Cristina and George's wedding at Neal Urban Studio, the bride said she really wanted a fun photo with her flower girl at the house. She thought we could think of something to do to incorporate the veil. Once we arrived to the house and saw this room, we knew this was the location the the bride was getting into her wedding dress in. We cleared out some furniture for more space. After she was completely ready, we brought in her flower girl. We decided to pull the cathedral length veil over both of them. Then Cristina took hold of the flower girls hands. The flower girl was a mini version of the bride. She had a great personality, just like Cristina. And her dress was made very similar to the brides! We love the whole scene. The chairs in both corners are great. We pulled the curtains in a little on each window. Then put Cristina and the flower girl right in the middle. The bride and groom got married at Holy Family of Jesus, Mary, and Joseph Church (formerly St. Joesph's) in Niagara Falls, NY. We went to a private residence called Haseley Farms for the idle. Also, to Wagner Farms in Sanborn, NY. The reception was at Samuel's Grand Manor in Williamsville,NY. The wedding date was July 8, 2017!